Honest Jon’s Records present Solo Guitar Volume 1, a reissue of Derek Bailey’s Solo Guitar release on Incus in 1971, with additional tracks included on previous reissues and a performance at York University in 1972. 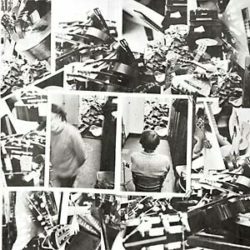 Kicking off a series of collaborations between Honest Jon’s Records and Incus: three double-LPs of the legendary free-improvising guitarist Derek Bailey, solo and in duos with Anthony Braxton (HJR 201LP) and Han Bennink (HJR 202LP), augmenting the original releases with marvelous, previously unissued music. Recorded in 1971, Solo Guitar Volume 1 was Bailey’s first solo album. Its cover is an iconic montage of photos taken in the guitar shop where he worked. He and the photographer piled up the instruments whilst the proprietor was at lunch, with Bailey promptly sacked on his return. The LP was issued in two versions over the years — Incus 2 and 2R — with different groupings of free improvisations paired with Bailey’s performances of notated pieces by his friends Misha Mengelberg, Gavin Bryars, and Willem Breuker. All this music is here, plus a superb solo performance at York University in 1972, a welcome shock at the end of an evening of notated music. It’s a striking demonstration of the way Bailey rewrote the language of the guitar with endless inventiveness, intelligence, and wit. As throughout the series, the recordings are newly transferred from tape at Abbey Road, and remastered by Rashad Becker.